I am jumping into Gillian’s weekly blog event, Looking Good, celebrating the things that look good in our gardens and neighborhoods. I am not much of a gardener, because the wild plants do so much better than anything I try to grow on purpose. 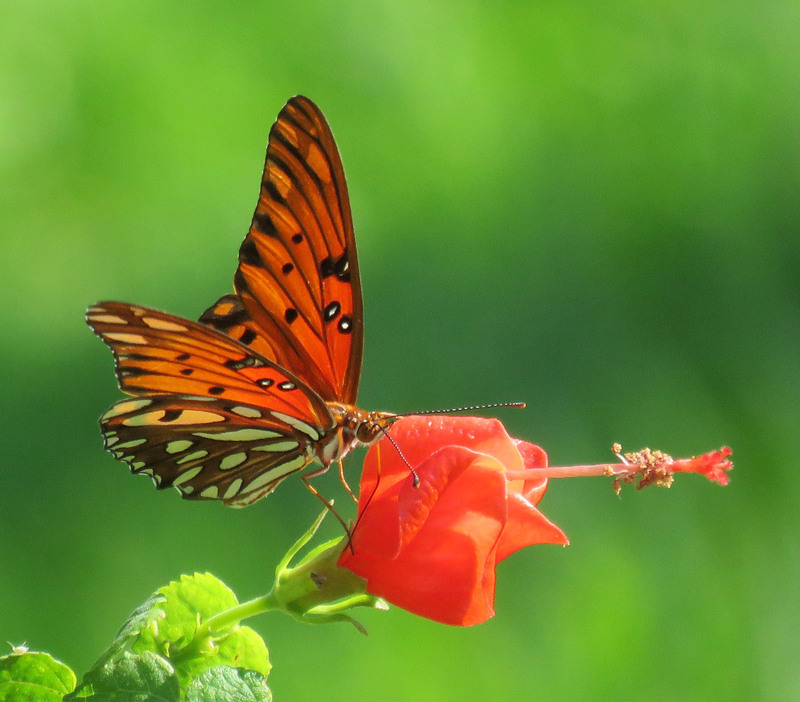 This week I had a Gulf Fritillary visit the Turk’s Cap (Malaviscus arboreus var. drummondii). If you look up to the top left, you will see a leaf-footed bug in the picture too. Gulf Fritillary on Turk’s Cap. 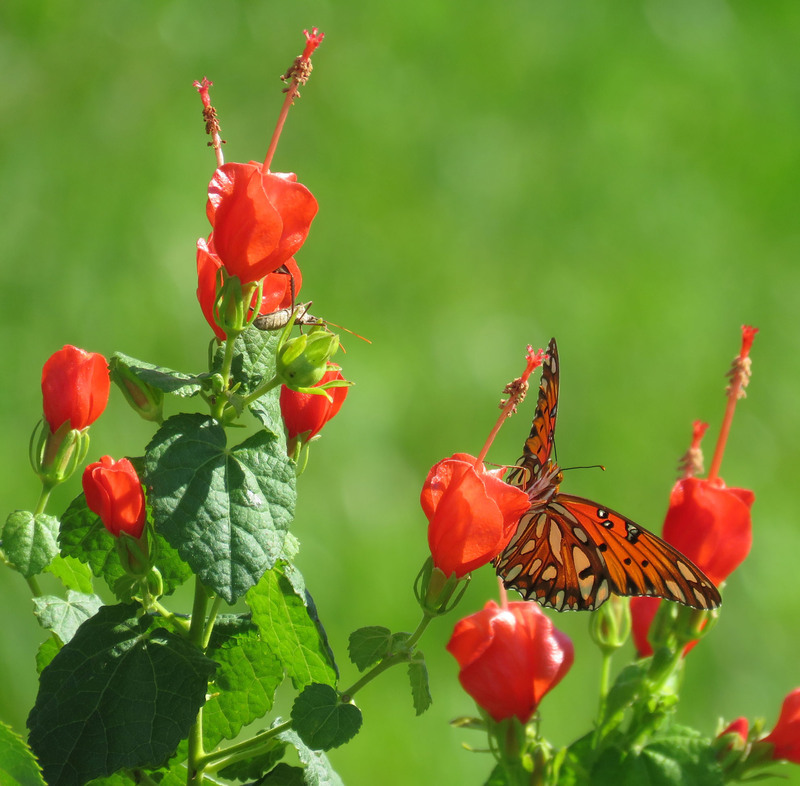 Turk’s Cap is a native Texas plant that does well in our area, from here in the sandy soils of the Pineywoods, to way down in the clay gumbo soil of Sugar Land (and possibly further, but those are the places I have experience with it). It grows to be about 8 feet tall and forms giant bushes. Once you plant it, you can forget it! It lives through freezes, droughts, floods, and deer. Hummingbirds and butterflies love it. Please drop by Gillian’s blog, Country Garden UK, and check out all the other links. I promise you, you will feel refreshed when you do! And if something is looking good in your neighborhood, give us a look! 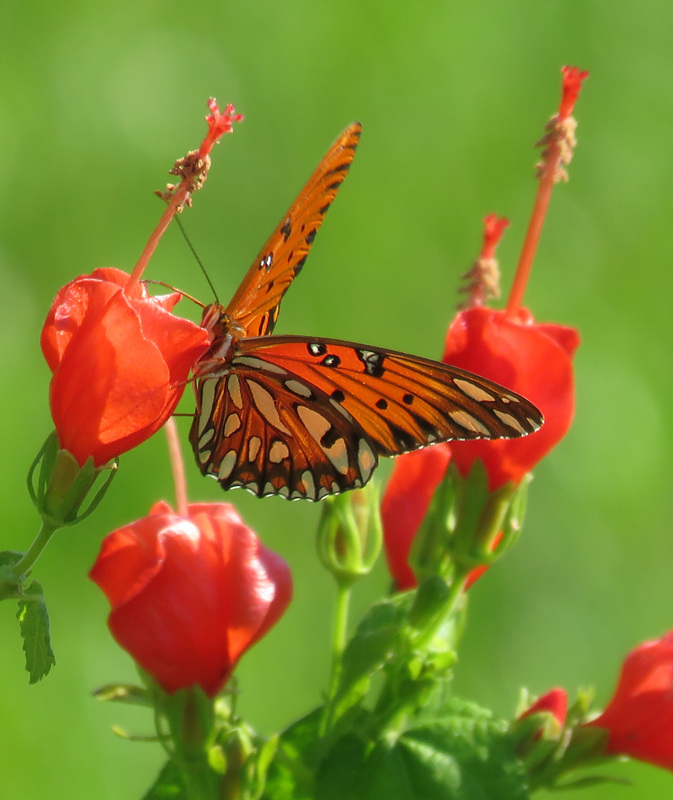 Your Gulf Fritillary butterfly is stunning and so is the flower it is feeding from, a lovely photo for late summer. Thank you! I was happy to see one so late in the summer! Thanks very much for joining in with Looking Good today. This sounds like my kind of plant! It’s great when they thrive and attract wildlife too. It looks like the butterfly and Turks cap were made for each other. Oh my goodness–those photos are simply unbelievable! The colors and composition and everything! It makes me feel like I should sell my camera . . .
Those photos are stunning. Think both butterfly and flower were posing just so you’d get their good sides. These are absolutely beautiful photos! Try using manual focus instead of automatic 90% of the time that will give you sharper pics. Set your focus points on the camera. Then when you are taking a picture first hold down shutter half way to where you want the focus to be and then press the shutter button all the way down. I know it works this way on Canon DIgital SLR not sure about other camera models but probably pretty much the same. Thanks for offering some help! I have tried manual focus. With this camera I have to press the four way directional buttons on the back to focus it, and that in itself moves the camera around while I am trying to see what’s on the back screen, and it seems to move really slowly. And then whatever I am focusing on flies away. With auto focus, I do do the press-halfway-down thing, but I will swear that everything looks focused, and then when I see the picture on the computer, the grass in the background is in sharp focus but what I was trying to focus on is a blur. It’s like the camera just wants to look behind where I’m looking. What camera mode are you using and what are your settings when you notice this happening? OK, after reading your question, I went back and really studied the Photoshop settings history for a bunch of the pictures. I know I have tried setting the aperture, the shutter speed, and both, as well as taking everything automatically. But when I look at the info, it tells me what F-stop, etc., the camera used, but I can’t tell if I set those parameters for that shot or if the camera did because I had it on Auto. The one thing I can see that is different between batches of shots is Metering Mode – I have varied between Spot, Center Weighted Average, and Pattern in trying to get sharper pictures. It seems to me that I should be using Spot for macro, Pattern for landscape-type shots, and Center Weighted Average for sort of small subjects. Is that right? On the metering settings that will be more what works out for you I leave mine on center weighted for the most part. On the mode that would be the AV, M, TV. P. B on Canon cameras. If you want to control your control depth of field use AV, If you want to control everything use M the rest are all different. What camera do you have so I can look it up? I have the Canon Powershot 60. I know I have TV and P. I think I need to practice more with the AV. Thanks for the info on the metering mode. Thank you! I will indeed practice and we will see how it goes! Try it out on something like setting a glass on a table outdoors make sure the sun is behind you or beside you. Try settings like AV mode set at F22 then same shot at F10 and then again at F4 or as low as you can go with your lens. Then put those comparison shots side by side and look at the depth of field /aperture and see the difference in them. This is the best way to practice the learn. I will try that. I went out yesterday and took some insect pictures that looked perfectly focused on my screen, but when I got inside and put them on the computer, only 1 was any good. But it makes a lot of sense to practice with things that don’t blow around in the wind. I will let you know my results! Still photography teaches us a lot including patience for the things that do move lol. Things that move, flutter, run, jump and fly need a faster shutter speeds or they will blur. I can’t attest to your gardening prowess, but your photos are spectacular!